C3 (Carbon / Cork / Composite ) technology is a surfboard construction method initially developed by East Coast US board builder, Drew Bagget. Our relationship with Drew began when he walked up to our (Surf Expo) trade show booth holding an early version of his construction. Although still a bit crude, and not completely refined, I was immediately enamored with his creation. 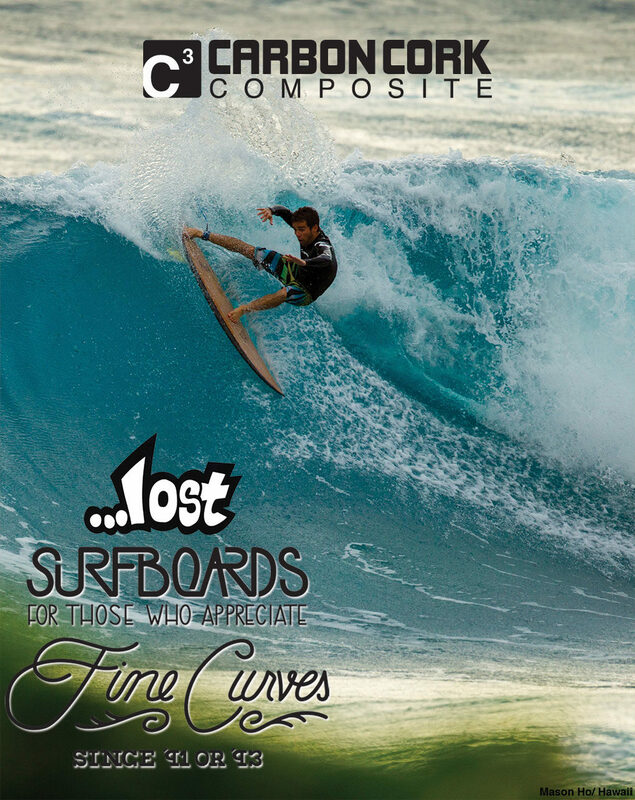 After more than two years of both technical and aesthetic RnD, from myself and the team at …Lost, together we have arrived at a patent protected product that we feel brings valid performance merit to your surfing experience. Beautifully built boards, combined with …Lost Surfboards latest models, that resemble nothing else available today. The construction starts with light weight, stringer-less, eps blanks. The blanks are cut and shaped from the same cad designs, and hand finished, like all of our custom surfboards. The deck and rails are then wrapped (and vacuum bagged to remove all excess resin) with our exclusively developed, uni-directional, carbon fiber cloth. Carbon fiber is the 2nd most common natural element on planet earth and remains one of the highest strength to weight ratio, and cost effective building materials available. The Carbon runs nose to tail and is held together by an “S” Glass fill, running across the deck. The specially “cored” Carbon is an extremely flat weave that doesn’t fray or “fuzz”. The vacuum process removes all the excess resin. The Carbon structure, unlike wood stringers, stays consistent and wont break down over time… ensuring a very light board that is also strong and has a fast, lively and predictable reflex memory. The carbon wrapping the rails creates a “C” structure that keeps the board from over flexing under the weight of the surfer, and minimaizes torsional flex. Thicker boards (and thus rails) for larger surfers, are proportionately more rigid than the thinner boards… for lighter surfers. The Second unique feature is the natural, exposed, “CoreCork” sheeting that is also vacuumed to the deck. We purchase our CoreCork from Amorim, an over 100 year old company…with a surfing CEO, who use protected Portuguese trees, that are never killed, but “harvested”, like a Sheep’s wool, every 8 years. Cork is a natural vibration dampener and its use in our boards negates the often twitchy, erratic feel of other epoxy surfboards. The Cork deck gives the surfer a smoother, more neutral and predictable ride. Our cork is purposely left exposed, with no fiberglas over the top of it. When vacuumed onto the carbon, the C3 process pulls resin completely through the cork, adhering it firmly to the deck. The excess resin is sanded off, leaving a smooth, raw cork surface to stand on. The is no need for wax on the cork areas of the C3 boards. When wet, the cork becomes a natural, non abrasive, non-slip surface. Standing and surfing on the C3 cork deck is akin to putting on a nice pair of sandals after walking barefoot for hours ….smoothing out the ride. V2 SHORTBOARD: This is the most anticipated new shortboard model we have had in years. The RnD process proved this board as suited to the “Domesticated” surfer, as to the traveling Pro. Starting with what I considered to be our most hybrid, the V2-Rocket, I stretched the nose outline into a pointy, yet conservative, nose and blended the winged “Rocket” tail into a smooth curving squash with generous surface area. The exceedingly low entry rocker, coupled with continuous and generous tail lift, made for a board that both paddled and rolled into waves well, but turned tight and precise in the pocket. Tons of positive feedback followed with almost instantaneous success making it one of our most popular shortboards right out of the gate. V3 ROCKET: The V3 is an extension of the Rocket collection. We were looking for a one board quiver type of design. Starting with the V2-Rocket, the most notable difference being the double wings cut in the tail outline. These wings accelerate the reduction of surface area in tail curve, resulting in a noticeably narrower “Rocket” tail. Less width behind the rear foot equals more precision and more control in the pocket. It also allows for functionality in a wider range of wave size. The tail width at 12″ is still substantial, netting a board that still feels fast, stable and squirty …even in smaller surf. When ridden as a quad, the narrower tail is freed up, allowing the surfer to stand a bit further forward and still remain loose and free in small surf. The nose outline was also pulled in a bit, in the 12-18″ area, netting a more elliptical, catch free, overall outline that fits into curvy wave faces better than Rockets of the past. Easy to paddle and surf in small or crowded conditions. The V3-Rockets higher performance characteristics in relation the other Rockets (and their wide tails) makes it the “fishy” board for guys who don’t ride fish! WEEKEND WARRIOR: Our latest and greatest “Domesticated” model. It came about after a couple months of myself riding the new V2-Shortboards. When the surf got tiny I did not want to go back to the radically different small wave boards and have to adjust so dramatically back and forth. It seemed I needed a new twist on a small wave, pointed nose, shortboard design. The extreme wide tail creates a very straight outline in the rear half of the board (reminiscent our our “Tri-Fish” and other Rocket Fish of the mid 90′s), so I figured I could increase the concave for more lift in small surf, which also added significant rail rocker. For the tail shape, I was thinking swallow, but it looked old and done a million times. so I first cut a diamond into to it, hoping to shorten the rail line further and allow one to stand a bit more central on the board, and then taking a cue from many of the young indy-hipster shapers, I cut a deep wedge into the stringer. This created a “Split Diamond” tail. All the elements add up to a shorter, compact and effective small wave design that is high on volume, but holds in and carries it well. RV: The latest in our quest for the ultimate “Domesticated” design. The RV is exactly as its name implies… A “Recreational Vehicle”. Designed for extracting maximum fun with minimum effort and ease of exploitation of your precious free time… If you want to cruise the coast in style and comfort, surf in a resplendent state of wave catching excess and bliss, then the R.V. is for you. The design stems from a blend of the Bottom Feeder/Couch Potato/LayZtoy genre. Noticeable updates include the double wing flyers added to the tail, to reduce surface area and increase bite and precision in turns. Tahe reduced surface area adds confidence of not sliding out in hard snaps, and carves. The novice outline has also been tweaked to reduce some are in the forward 12-18″ of the board, but without reducing drive down the line or paddle ability. The nose feels like it “comes around” quicker in turns and looks …and feels, like more of a performance design. Get on an R.V. and enjoy your recreational time like you never knew you could!